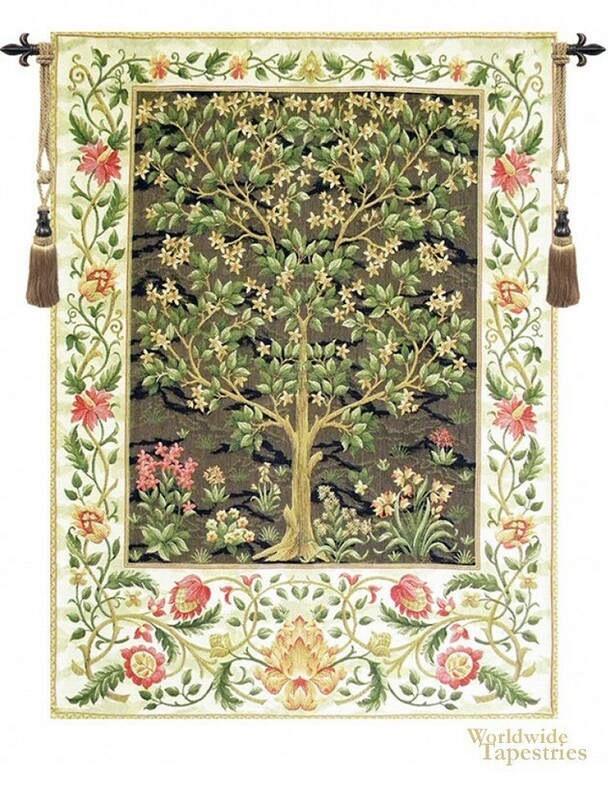 This beautiful tree of life tapestry shows the immortal tree of life inspired by the work of William Morris. The tree of life represents the immortality of life, and the connection between earth and heavens. The tree's root reach deep into the earth while its branches reach towards the heavens. Here we see the tree in full bloom with peach flowers. The color palette of this tapestry in particular is exceptional as the earth toned background provides a gorgeous balance to the yellow beige border with peach and fuchsia flowers providing irresistible color and warmth. The tree of life is in balance and beauty right here in this piece. This tapestry "Tree Of Life Brown" is backed with a lining, and has a tunnel for easy hanging. Dimensions: W 26" x H 35"